Burr Angle describing industrial development along the East Side rail corridor. Burr Angle presented a very interesting program on why the east side of Madison became the factory side of town, with information on the men and their companies that located here. Much of his information came from studies done by UW Geography Prof. John W. Alexander titled: Geography of Manufacturing in the Rock River Valley (1949) and Economic Base Study of Madison (1953). Why the east side? There was an abundance of cheap, level, dry land served by two railroads. 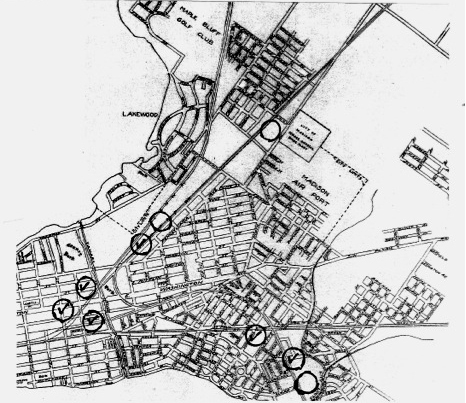 Lots suitable for factories were located within walking distance of inexpensive building lots for housing for workers (Elmside, Hudson Park, Fair Oaks, Eken Park, North Lawn, etc.) and upscale areas (Maple Bluff and Lake Monona shoreline) for more expensive homes for the factories’ owners and managers. Entrepreneurs made it happen: Morris and Edward Fuller and John A. Johnson (Fuller & Johnson and Gisholt); Conrad Conradson (Northern Electrical Manufacturing Co.); Jackson Reuter (Madison Plow Co.); the Coleman family (Madison-Kipp); George Steinle (Steinle Turret Machine Co.); Theodore Kupfer (Kupfer Iron Works); Henry & Harry Vogts and Edward Schwenn (Madison Brass Works); Magnus Swenson (U.S. Sugar Beet Co.); Ray Trusler and Clyde Woody (Madison Cement Stave Silo Co.); and Ben Anderson who made Clean-Easy Milking Machines. The companies were successful because they made high-value, low-bulk specialized products (farm implements, electric motors, machine tools, brass fittings) with clean, centrally-generated power (electricity from coal) and imported metals (iron, steel & brass). The products were of such high quality that they could be sold in distant markets in direct competition with other similar manufacturers. Both the owners and workers were hardworking, well-educated Yankees or immigrants who wanted to locate in an attractive, well-run city and have the opportunity to participate in its civic life. Burr Angle and Dolores Kester are co-authors of a Walking and Biking Tours notebook, a compilation of background information on these and many other companies whose factories are or were located along Madison’s railroads, most of which have been turned into bicycle paths. This makes it easy to travel through the isthmus and imagine what it was like to work in one of the factories between ca. 1880 and 1970. Some are still producing today. In 1930 six of the nine industrial area on the east side were used by metal fabricating firms. The notebook titled: Walking and Biking Tours in Several Industrial Areas of Madison Wisconsin, 1880-1970 is available in Madison libraries and on the Historic Madison, Inc. website. Saturday April 20: East Side Works! Iron Works Building ca. 2001 Photo courtesy of John Martens. 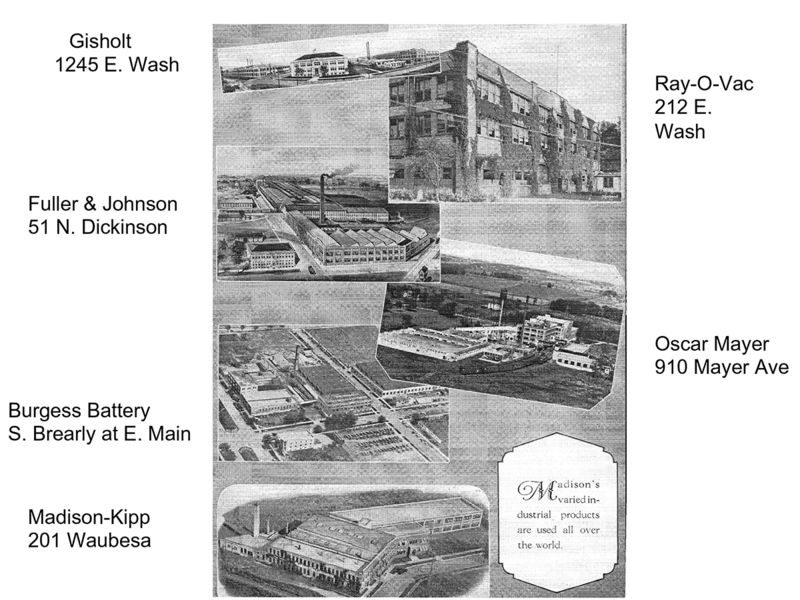 Early last century Madison’s “movers and shakers” decided factories should be located on the east side of town. Soon eight factories were built along the rail corridor between Baldwin Street and Olbrich Gardens. 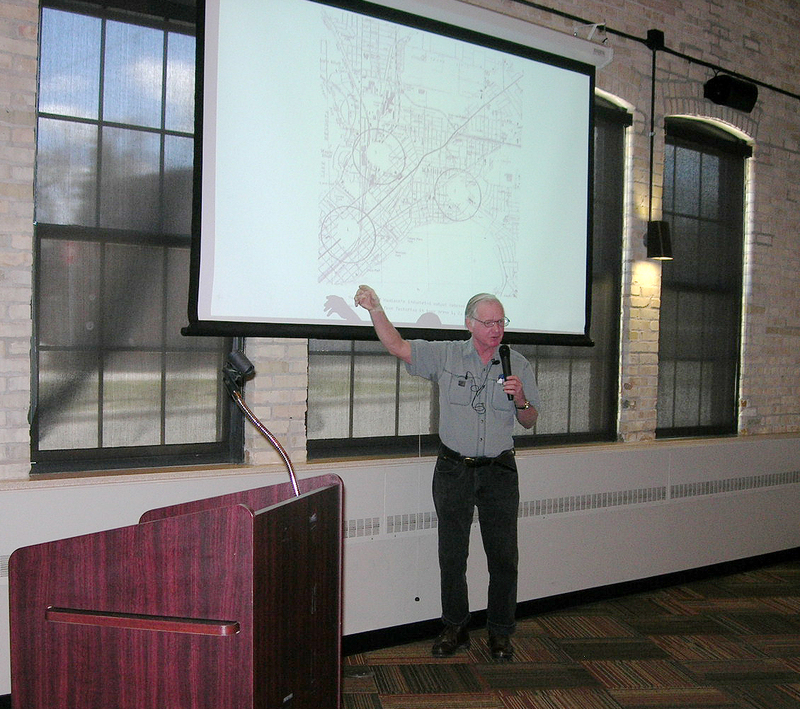 Using maps and photos from his tour book on historic Madison industries, Burr Angle will share info on the men and factories that grew up along the East Madison rail corridor/bike path. Bring your industrial memorabilia to share!